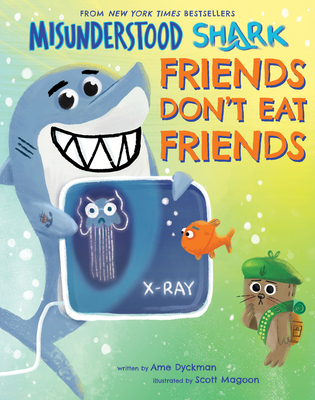 In this new Misunderstood Shark story from New York Times bestselling duo Ame Dyckman and Scott Magoon, Shark dares to ask the question: Can friends eat friends (and get away with it)? "SHARK ATE ME! Now get me OUT, Shark!" "That's strange! I can hear Bob, but I can't see Bob!" This hilarious follow-up to Misunderstood Shark by New York Times bestselling duo Ame Dyckman and Scott Magoon tackles what it really means to be a good friend. Bob is already irate that Shark has eaten him, but when Shark doesn't admit to eating him, Bob is so mad he declares that the ocean isn't big enough for both of them! Friends Don't Eat Friends is exploding with over-the-top humor and awesome marine facts! For example, when Shark overdoses on Finilla Ice Cream after fighting with Bob, we learn that shark teeth are coated with fluoride. Lucky for Shark, he can't get cavities! Join Shark and the gang for another story and find out if Shark learns his lesson about friendship, or if he really is just misunderstood -- again!